Just like any other battery powered portable device iPhone, iPad and iPod touch show the current state of the battery in the status bar. However iOS takes the concept of indicating remaining battery power a bit further by displaying it in percentage. Most people already know how to enable or disable the battery percentage of iOS but for those of you who don’t know how to hide or unhide it we are here to help. In this short tutorial we are going to tell you how you can do it. 1. On your iPhone, iPad or iPod touch open Settings.app. 2. From Settings go to ‘General’ and then tap on the ‘Usage’ option. 3. Next turn the ‘Battery Percentage’ toggle on if you want the percentage to appear in your status bar. Alternatively you can turn it off if you want don’t want it. That’s it! 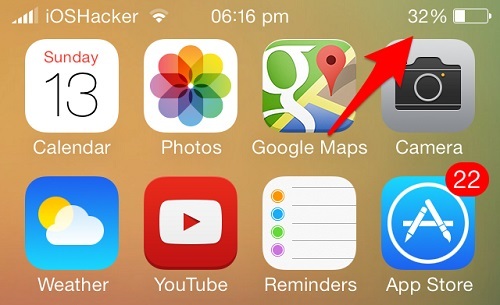 Now you know how to show or hide the battery percentage on iOS’s status bar. This method is same on current and all older versions of iOS including iOS 8, iOS 7, 6 and 5. Update: For help on how to enable/disable battery percentage on iOS 9, refer to this guide here. Please note that this method will not replace the normal battery indicator and the percentage will appear on its left side. As of right now there’s no way of completely replacing the traditional battery indicator with percentage.